In south Oklahoma City, good pizza is hard to come by. If your taste favors the cardboard-flavored, heavily processed fare from joints like Mazzio’s and Pizza Hut, you should probably stop reading now. But if you’re a southsider who yearns for something more than the usual suspects, then Marco’s Pizza, newly opened at 12201 S. Pennsylvania Ave., is the place to go. Marco’s was founded in 1978 by Pasquale “Pat” Giammarco, who moved from Italy to the U.S. when he was nine. Since then, Marco’s has expanded to more than 200 food joints in 18 states, in cities like Edmond and Lawton. This new locale, however, is the first to open on the city’s south side — and hopefully not the last. Unlike some establishments, lifting the lid on a Marco’s pizza box isn’t a game of chance where you keep your fingers crossed that the crust isn’t burnt and wonder if the pizza dough is sufficiently sauced. Instead, it is like breathing a whiff of Italy into your home. When you order a pizza at Marco’s, you can select from four sizes, starting with the 10-inch small for $7.99 to the 16-inch extra large for $12.99. After you select your size, you are presented with a smattering of more than 20 topping options, ranging from meatballs and grilled chicken to feta cheese and pineapples. Even if you prefer a classic pepperoni pizza, you have two types to choose from: the typical American style and traditional “old world” pepperoni, a spicier meat. As if that weren’t enough, all pizzas also come with free crust toppers; delicious flavorings that turn that bit of breading that you tear off and give to the dog a truly tasty treat. Topper choices include garlic butter, Roma seasoning, Parmesan and ranch. 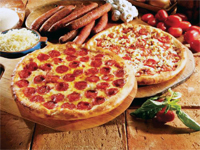 If you’re not in the mood for pizza, never fear: Marco’s goes above and beyond the calling of a normal pizzeria, offering everything from Italian subs to chicken wings, salads, and a $9.99 meatball and sausage platter. Possibly the only downside to be had at Marco’s is that there isn’t enough space to dine in — but when you can either walk in, call, or go online at www.marcos.com to order delicious pizza and have it ready in less than 15 minutes, that really isn’t a problem to begin with. Whether you’re a southsider like me or you’re looking for a fast inexpensive, and most importantly scrumptious meal to take home after your classes, take a quick drive down to Marco’s down on Pennsylvania Avenue.